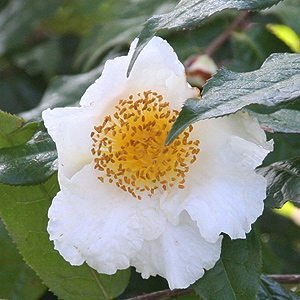 Not widely seen in cultivation, however with its attractive white flowers and nicely contrasting yellow stamens Camellia trichcarpa may indeed become available one day. As for the botanical name, it might be Camellia henryana var. trichocarpa or a species on its own, Camellia trichocarpa, we are a little unsure on this. The foliage is a deep green and heavily veined. Maybe not as prolific flowering as some cultivars we think it has a subtle beauty of its own. Although in its natural habitat Camellia trichocarpa can reach a height of 10m, in cultivation it rarely gets to more than 3m. A humus rich soil and protection from the hot afternoon sun are the major requirements. Camellia trichocarpa is worth growing for the large seed pos alone, like large flat apples, they look great when left on the plant ans they turn a deep brown when they open.